Le jeu marchait parfaitement avant ce problème PS4, j'en suis utilisateur depuis environ 1 an. J'ai désinstaller et réinstaller le jeu 2 fois, changer de connexion (wifi direct au modem ou wifi du répéteur wifi) les problèmes sont les mêmes. I play RL on my xbox one, I have good ping a good connection with wifi on the Xbox but in game it says that i have a bad connection and its lagging! How to fix this!!!!! And if my friend and i go in a party we don´t see each other. So we can´t play Ranked games! How to fix this problems!!! For past two weeks i'm experiencing Lags even tho my ping is ok - around 32 - it's really frustrating and i dont know what to do, i tried almost everything from this post but nothing seems to improve that.. my internet si working fine on other games and my friends are having these problems too... - i m from Slovakia so EU servers should be ok form me..
Alright there is something wrong with your servers, your end... or something going wrong.. played 30 games 15 in a row over 2 nights, only a few were fine, no issues what so ever.. a few others were ok to begin with then boom.. kicking one out, having connections issues .. Some literally just never started the game with connection issues.. never had a problem till this recent patch whatsoever.. yes I might be in OCE.. but surely..that shouldn't mean anything when connecting to OCE servers.. im saddened.. its the one game I enjoyed playing and having fun with.. but all the DC / Issues within game.. has made me dislike it fast.. I have many hours and much fun under the belt.. but something is broken now.. im sorry to say.. its losing me as a player.. very fast.. the fact that its 1/15 games (queue times are still there) I get to actually play.. nope.. im done... please fix this issue asap.. I feel I am not the only one as its been 3 states with 3 different connection speeds now I have experienced this since the patch.. and I would feel my 100MB / 40MB should be more than capable.. When the connection is not stable at kickoff, RL looks like playing loto.. no matte how you touch the ball, it seems that the server doesn't have the same informations that what you can see on your screen..
so you try.. and most of the time you miss and start getting frustrated.. If you need any info, just ask us, it would be a pleasure to help you ! Duty : Do everything to make Rocket League an even better place! Time syncs can prevent replay attacks . Without them, someone could record the packets sent between client and server, decrypt, modify data, then resend the packet stream and no one would be the wiser. But, because decryption takes time, a timestamp (validated on both sides) can indicate that the stream is a 'replay'. That means, the client needs to make sure that it talks to the right server; for that, the client will validate the server's certificate . But then i noticed something. Experiencing high ping (110+) on all EU Servers following the format "EUXXXXXXX" or "EUXXXXXXX-XXXXXX", "EU-Namedserver" is just fine at the usual 16 to 28 ping. I cant believe how incompetent the Psyonix Support is, they dont want to acknowledge is their problem not mine. They even tried to lie to me saying that my past ping tests were high and therefore was my problem, sad for them because I had all the screenshots I sent to them I month before. They dont listen to the community, they dont care at all. Psyonix lately it seems the only thing they care about its money, adding season pass, lootboxes and not fixing their damn severs after how much time? 3 years? This is a complete joke. They went as far on telling me that I must disable all my non-windows services in order for the game to connect succsesfully to their servers. I think it's time to review bomb the game on Steam. Soo I have really heavy and annoying connection issues, usually I have something between 60-90 Ping occasionally 50 but I don't understand why with that 60-90 ping I have issues like with 10000+ ping or even more weird is that at the end of the game my ping jumps to 300+ and with 70% of overtime games I have played my ping jumps to 600+ for no reason "just in overtime" and its not the issue of one server. Some information I believe might be useful. I have at home an ERX router managing outgoing trafic as I have two internet connections: one using DSL with low ping (50ms) but also limited bandwidth (515KB/s [4.4Mb/s]) and another one using 3G/LTE with relatively high ping 150ms range but high bandwidth (3MB/s [20+Mb/s]). As you guessed, I have setup my games trafic to go through the DSL line and everything else (HTTPS, streaming an so on) goes through the LTE link. RocketLeague configuration pushes everything coming out my LAN with a destination port in the 7000-9000 to the DSL line. And it all works fine except for the rare server occurence where I get 150ms ping consistently meaning I am on the LTE connection. Wireshark is used to check outgoing trafic and you can see that the IP trafic is going to port 62220 !!! So the conclusion is that, depending on the servers you are connecting to, the ports ranges are not compatible with the 7000-9000 range. That's on a sunday afternoon in EU. I am guessing that as additional servers get added to cope with the rise in population and attributed ports are different. People who have strict firewall rules probably can't connect to these servers but people like myself who are doing load balancing do have bizarre issues. This might also explain why some people have inconsistent experience as their routing equipment QoS rules might not apply in some cases (trafic is not prioritized as expected). Can anyone confirm that this out of range ports also occur for them? since a few days I have issues over all games with the message "package loss" - the ping is ok in a range of 40 - 80 (dependent on which server joined), it's stable. The color of the package loss message switchs between yellow/orange and red. 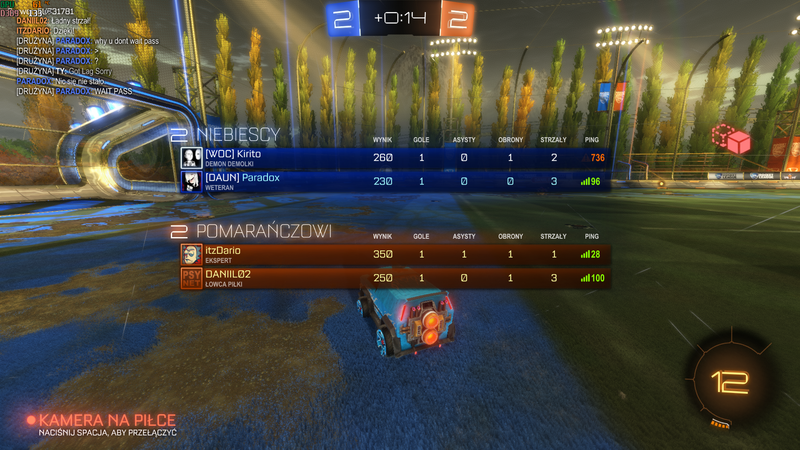 The result ingame are lags, wrong positions of all players and picking up the boost later. How I can fix that, are there main problems in the game or is this a specific problem? Many players confirmed my problem in the same game, I also reported some server in hope, they will be checked. How to check connection quality info? Recently I have been experiencing consistent issues in every game I play with packet loss. Nothing has changed on my end and I have played this game issue free for a number of years... This has been happening for the last few months or so. Please let me know what the suggested fixes are for this problem. I just got rocket league on pc and at first it was running at around 130 fps on a wireless connection but when I joined a game my ping would be like 200 and I already checked my region and then I played around with the settings and closed the game and reopened it and then it was running at 30 fps but my ping was fine and that was after I plugged in a Ethernet. How do I bring my FPS up besides changing settings which I already did? A few days ago, when I hopped on Rocket League, I found that I wasn't connected to the servers. So I go to connect, but it says error, and to try again later. This has been happening for the past 5-6 days, and I haven't been able to connect to the Rocket league servers. I tried practically everything in the forecast make, but it doesn't work. Can someone help out with this? Did my account get banned?